If youre looking for a high performance Mac laptop at an affordable price, this Late 2013 Retina Macbook Pro is an excellent choice. At 13.3-inches, its the perfect size to carry with you. And the high resolution Retina display gives you an expansive view of your photos, spreadsheets, videos and games. Its powered by the fourth generation Intel processor and includes a high speed flash drive and two Thunderbolt ports. This refurbished Macbook Pro is a portable workstation at a low discount price from GainSaver. 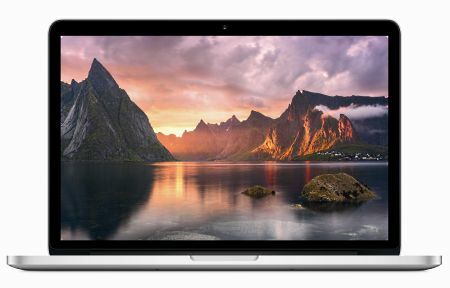 Although the used 13.3-inch Macbook Pro is small and light, it packs a punch with the fourth generation Intel Dual Core i5 processor, running at 2.6GHz. Each core takes advantage of Hyper-Threading to handle multiple processing tasks at the same time. Youll notice the performance difference when you run your image processing programs, video editing apps and graphics-intensive games. They all run fast on the fourth generation Intel processor. The cheap used 13.3-inch Macbook Pro is an ideal companion to take with you on the road. Especially with the Retina display. The discount Late 2013 Macbook Pro has a bright, high contrast Retina display with 2560 x 1600 resolution. When you look at the screen, you cannot make out the individual pixels they are so small. This makes reading a pleasure. And it allows you to have a much bigger desktop to show all your icons and menus while you use your favorite applications. The Retina display on the discount Late 2013 Macbook Pro has reduced glare without dimming the colors or lowering the contrast. And with the built in IPS technology, you can view the screen from the side at angles up to 178 degrees without losing picture quality. With IPS technology, you wont mind sharing the screen when you watch movies on your cheap Macbook Pro. The large glass Multi-Touch trackpad on the used Macbook Pro has no buttons. You can use the entire surface to control your Macbook Pro. The Multi-Touch trackpad is smooth and comfortable to use. It supports many different gestures to give you total control of your affordable Macbook Pro. You can swipe and pinch and tap to navigate programs and switch between applications. Typing is also a pleasure on the refurbished 13.3-inch Macbook Pro. It has a full size back-lit keyboard that is easy to type on. The affordable Macbook Pro has a light sensor that automatically adjusts the brightness of the keyboard so you can always see what youre doing. The discount Late 2013 Macbook Pro has no old fashioned hard drive. The storage is all flash. Flash drives are much faster than spinning hard drives, and a lot more reliable. Not only that, but the PCIe flash drive in the 2013 Macbook Pro is 60% faster than the flash drives found in previous models. This means everything you do is significantly faster, from booting up your Macbook Pro to launching applications and accessing large files. The PCIe flash drive in the Late 2013 Macbook Pro means waiting is a thing of the past. GainSavers exclusive customization options allow you to configure your cheap used Macbook Pro any way you like  something you cant do when buying new. The Configurator gives you a list of menu options you can choose from to increase the memory and hard drive capacity, select the Mac OS of your choice, and even install Windows to create a dual operating system. Go through all the menus and select from the available options. Click the Buy Now when you are finished.